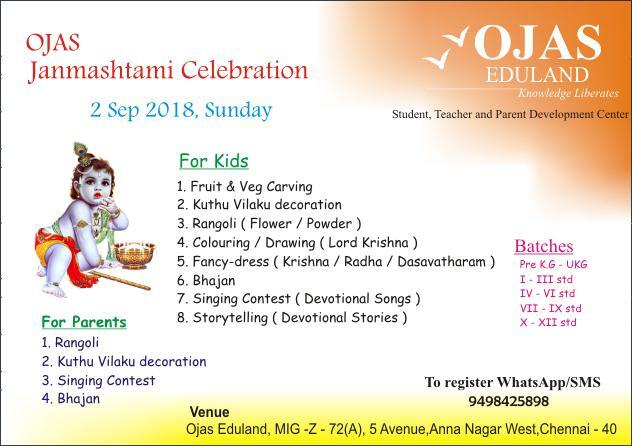 “OJAS Eduland” conducts “Janmashtami Celebration for kids and Parents” on 2nd Sep 2018, Sunday. This time we have competitions for parents too. Participants have to bring Kuthuvilaku for decoration. Flowers, clothes, sticks, colour powders can be used to decorate the lamp. Participants have to bring colour powder or flowers. 2 by 2 feet space will be provided. Parents ( Mom / Dad ) can sing bhajan.